Please note the date of this article! At the time I wrote this, Ionic Services had recently been given a major update, but they were not fully released yet. What you see in the future may be different than what I demonstrate here! 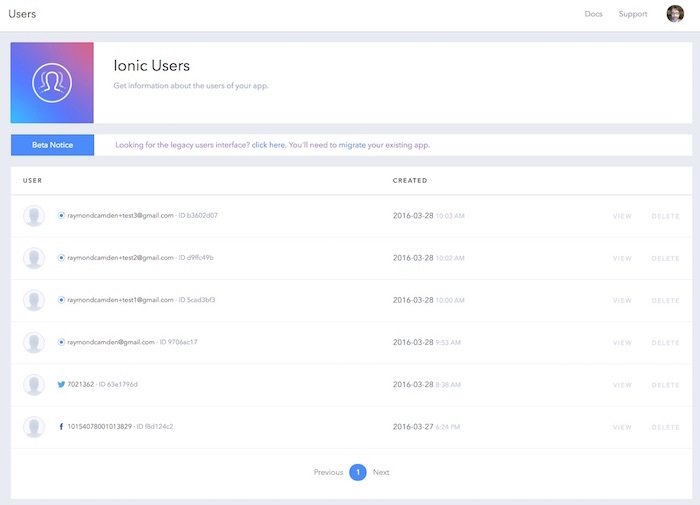 A few weeks back Ionic released a brand new version of their services platform. 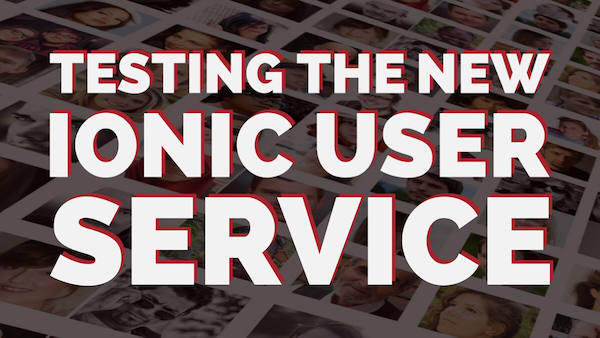 (I discussed it here: Ionic Services enter Beta). At that time, I didn’t really have the bandwidth to play around with the updates. This morning I spent some time focusing on the User system and I thought I’d share my findings. As I mentioned in my earlier post, the User system went from “kinda nice but not terribly useful” to “really freaking good”. You can now handle social network logins, custom logins, password resets and custom data. 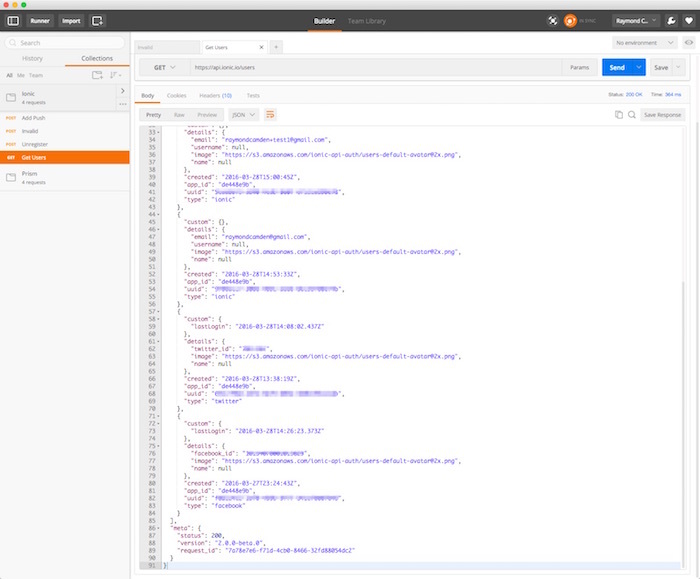 You can also get access to your users via a REST system for complete back-end integration. I built a simple demo to test various aspects of the User API. You can find the complete code for my examples here: https://github.com/cfjedimaster/Cordova-Examples/tree/master/ionicUser2. Please keep in mind though that this is not a proper ‘app’, but mainly a test bed, so the code is not optimized and not appropriate for a real application. At this point, what you see is based on what button you click. 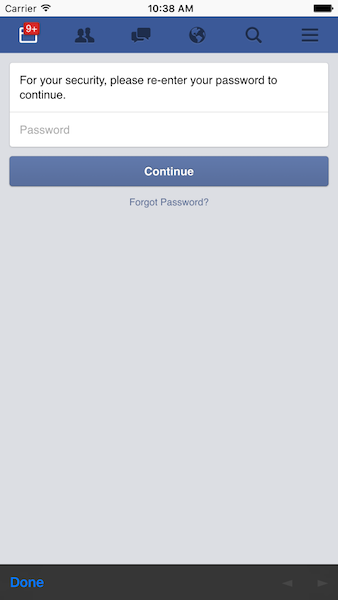 Here is what Facebook login looks like. Notice that I’ve previously logged in. It is just asking me for my password at this point. Oddly - I don’t see a way to change that, and in fact, I could click on the top bar there to browse my Facebook account. That could be a problem. It may be outside of Ionic’s control, but I’m going to file a bug report for it right now. On the other hand, Twitter did not seem to cache anything, which is good. Notice that it is telling you that the app has write access to the account. 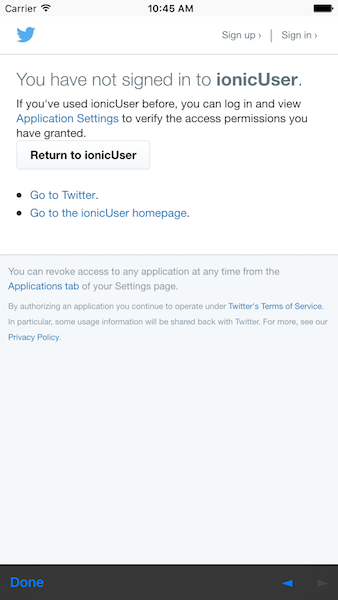 If you are only using Twitter for login, you will want to go into your app settings and change it to read only. I just did that, and it was reflected right away. I apologize for the slightly ugly display there. Notice that my Facebook ID was returned correctly, but nothing else. (I haven’t filed a bug report for this yet as I’m waiting on confirmation that we should get something.) 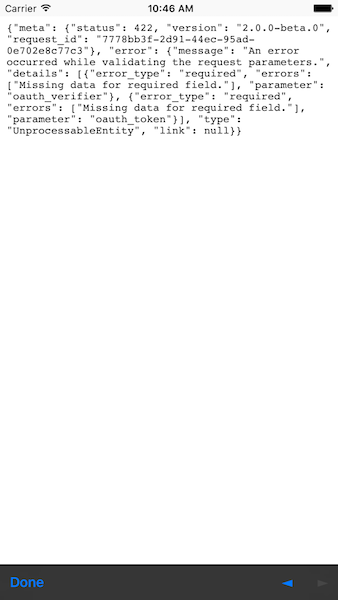 In theory, I could then make use of the Facebook Graph API to get information, but I don’t have access to the access token that Ionic used to authenticate. That means - afaik - I’d have to prompt again for the user authentication which wouldn’t be nice. The same issue applies to Twitter and I assume the rest of the social login providers. You can store simple values and arrays, and they even support custom types if you want to get fancy. As an FYI, user data is stored in LocalStorage on the device. This enables you to know about the user even when you are logged out. As an FYI, this information is not removed from LocalStorage when you run Ionic.Auth.Logout(). I think that is a mistake and I’ve logged a bug for it. When I mentioned it on Slack, another user mentioned it may be useful to keep it around, but at minimum, this should be documented. I also logged a bug asking the Ionic folks to clearly state where keys they use in LocalStorage. The docs tell you they use LocalStorage and warn you against removing it with clear(), but they should also clearly document the keys they use. I can’t see anyone using the same names you see in the screenshot above, but, I’m kinda OCD about stuff like this. //what's the user ob like now? First off, the docs mention a set of error responses. One that was missing was support for an invalid email address. Luckily, this is supported, just not documented. (I filed a bug for that.) 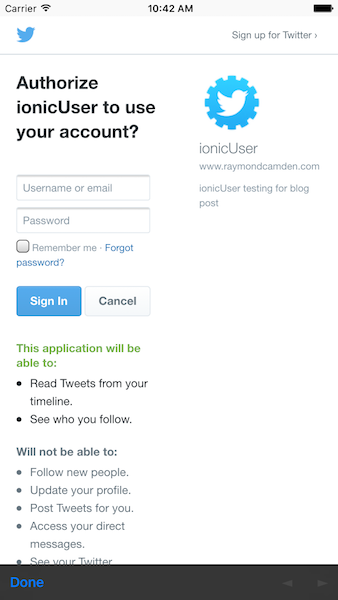 Another bug is that the success handler is supposed to pass an instance of an Ionic user. It does not - it just passes true. (Yes, I filed a bug report.) I can verify that signing up does not log you in. I built another button for that, but I think in most cases, you would embed the login directly within the success handler of signup. Currently you can’t change the email. I filed a bug report suggesting that we should be able to change the from name, the from address, the subject, and the email text (as well as providing both plain and HTMl versions). As I noted in my bug report, this should probably be a premium feature. 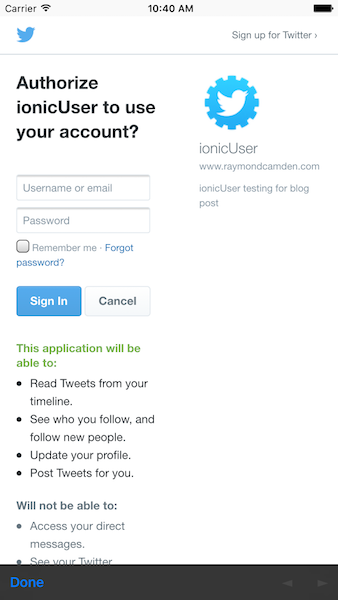 Notice that users created with the ‘basic’ style are marked as ‘ionic’ users while the Social-created ones have their social network specified. As a quick aside, the Ionic App’s site lets you browser users as well. Be aware that there is a caching issue there. I updated a user and then clicked to view their details and my new data wasn’t there. Reloading the page updated the data. That’s it. I’m going to try to build a “real” application using the service that could possibly be used as a starter for others. Let me know if you have any questions below.